Will Crushing Student Loans and Worthless College Degrees Politicize the Millennial Generation? The existing social and financial order is crumbling because it is unsustainable on multiple levels. The central state is not the Millennials' friend, it is their oppressor. No generation of young people is ever politicized by hunger in distant lands or issues of the elderly. It's no rap on youth that self-interest defines what issues have the potential to radically transform their political consciousness; the transformative cause must reveal the system is broken for them and that it intends on sacrificing their generation to uphold the Status Quo. The Millennial generation, also known as Gen-Y (Gen-Y comes after Gen-X), is generally defined as those born between 1982 and 2004. The oldest Millennials were children during the first Iraq War in 1991 (Desert Storm) and just coming of age in 2001 (9/11 and the war in Afghanistan) and the start of the second Iraq War (2003). 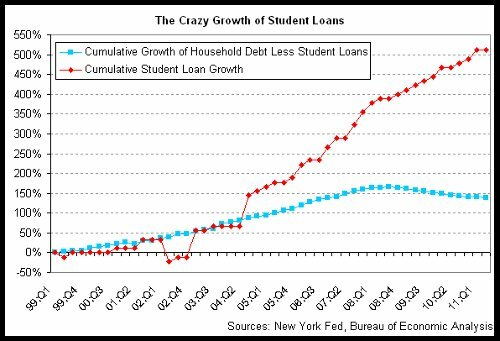 The Millennials have entered adulthood in a era characterized by permanent low-intensity wars and central-bank/state managed financial bubbles--2001 to the present. In other words, the only experience they have is of centralized state mismanagement on a global scale. The gross incompetence of the government and central bank--not to mention the endless power grabs by these centralized authorities--has not yet aroused a political consciousness that the system is irrevocably broken, not just for older generations but most especially for them. Anecdotally, it appears the Millennial generation is still operating on the fantasy that all they need to do to get a secure, good-paying job and a happy life is go to college and enter the Status Quo machine of government/corporate America. There are two fatal flaws in this fantasy: the $1+ trillion student loan industry and a transforming economy. The higher education industry in the U.S. operates as a central state-enabled and funded cartel, limiting supply while demand (based on the fantasy that a college degree has critical value) soars. This enables the cartel to keep raising prices even as the value of its product (a diploma) sinks to near-zero. 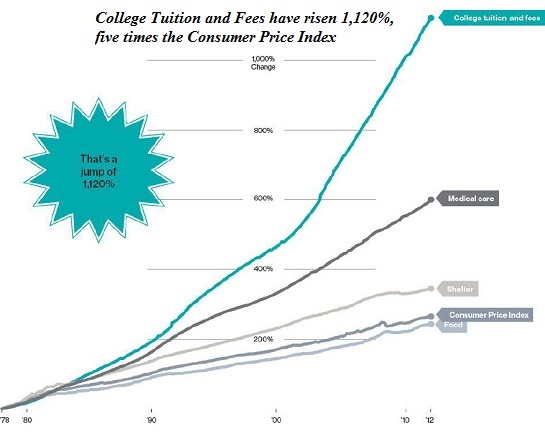 Since the Federal government issues and guarantees all student loans, the higher education cartel is (like sickcare, national defense and the mortgage industry) effectively socialized, i.e. funded and managed by the central state. If you understand the student loan system is predatory, parasitic and exploitive, you have reached first base of a meaningful political awareness. If you understand the central state (Federal government) funds and enforces this system, you've reached second base. 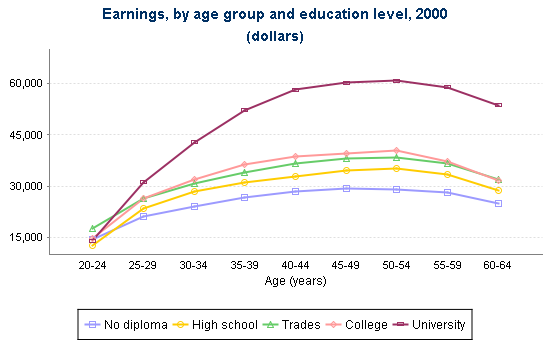 If you understand the vast majority of college degrees do little to prepare you to be productively employed in the real economy, you have reached third base. If you understand the Status Quo is unsustainable and does not operate according the the fantasy model you've been told, congratulations, you're close to home base. The central state is not your friend, it is your oppressor. The loan shark that won't let you discharge your student loan debt without appealing each ruling against you three times is the government (and its hired-gun proxies). The oppressor who demands you work your entire life to pay interest on public debt squandered on neocolonial wars and various cartels (sickcare et al.) is your central state. The entity who demands you pay higher taxes so the generation entering retirement gets all that it was promised, even though the world has changed and the promises are no longer sustainable? The central state. The oppressor that will devote its enormous resources to investigate and crush you if you actively resist the bankers and financiers who pull the political lackeys' strings? The central state. At some point, the Millennial generation will have to awaken to the fact that the only way to change its fate is to grasp political power and redirect the policy and mindset of the nation. Centralization is the black hole that is destroying the nation's social and economic vigor. Decentralization, transparency, accountability, adaptability, social innovation, a community-based economy--these are the key features of a sustainable social order. The existing social and financial order is crumbling because it is unsustainable on multiple levels. The Status Quo will cling to its false promises and corrupt centers of power until the moment the whole thing implodes. Welcome, Robot Overlords. Please Don't Fire Us? Podcast with Mike Swanson of WallStreetWindow.com on student loan debt and the Nearly Free University: Charles Hugh Smith On the Forces of Centralization and Soaring Education Costs. I always enjoy discussing issues with Mike, a polymath with a wide range of interests and experiences. Thank you, John M. ($10/month), for your outrageously generous subscription to this site -- I am greatly honored by your support and readership. Thank you, Joseph P. ($100), for your outrageously generous contribution to this site -- I am greatly honored by your support and readership. Cheap credit is a great boon to the wealthy and a path to debt-serfdom for everyone else. The ever-widening chasm between the wealthy and the "rest of us" has generated any number of explanations for this deeply troubling phenomenon. We can start with capitalism, which is based on competition for innovations, processes, markets, labor and capital. The more successful participants will naturally garner more profit and premium, leaving less for those who don't control assets and skills that carry high premiums in the marketplace. 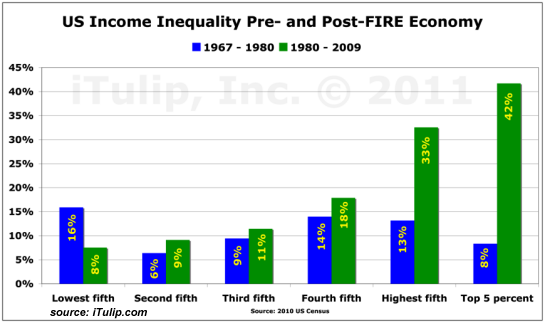 But this fundamental source of inequality doesn't explain why wealth and income inequality was considerably lower in previous eras of economic expansion. Many observers rightly point to the capture of federal regulatory bodies by corporations and the transition from an industrial economy with plentiful low-skill, high-wage jobs to a post-industrial knowledge-based service economy as causes. These are undoubtedly causal factors, but what most analysts either miss or dare not mention because it threatens their own privileged spot at the feeding trough is financialization, the process of financially commoditizing every asset to the benefit of the financial sector and the state (government), which also benefits from skyrocketing financial profits, bubbles and rising asset values (love those higher property taxes, baby!). Financialization is most readily manifested in the FIRE sectors: finance, insurance, real estate. Here's how cheap, abundant credit--supposedly the key engine of growth, according to the Federal Reserve--massively increases wealth inequality: the wealthy have much greater access to credit than the non-wealthy, and they use this vastly greater credit to buy productive assets that generate income streams that increase their income and wealth. As their income and wealth increase, their debt loads decline. 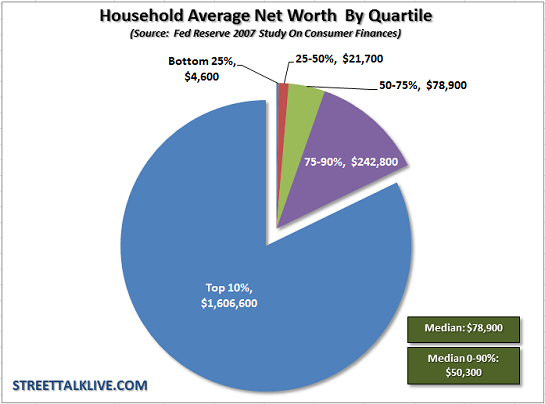 Compare the superficially well-off upper-middle class family with two incomes and a truly wealthy family. The upper-middle class family may have an income well in excess of $100,000, but it used its access to credit to buy non-productive assets such as a sprawling house with granite countertops, two luxury vehicles, etc. Even the horrendously costly college education for the family's kids is ultimately non-productive, since the students didn't learn how to successfully navigate the digital-software-fabrication-robotics-automation (DFSRA) emerging economy. The wealthy family bought a 24-unit apartment building with its credit. That property spins off positive cash flow every month, and that income stream supports a high asset valuation which serves to increase the creditworthiness of the family. Productive assets that churn out steady rentier income streams can be pyramided into ever greater access to credit that is also cheaper than the credit offered to middle-class households. Student loans have rates of 6% to 9%, for example, while the wealthy family can buy productive assets at 3% or 4%. The high earned-income household has access to cheap auto loans, but since the vehicles lose value the moment they're driven off the lot, this low rate is an illusory benefit. The family home is supposed to be a store of wealth, but the financialization of housing and changing demographics have mooted that traditional assumption; the home may rise in yet another bubble or crash in another bubble bust. It is no longer a safe store of value, it is a debt-based gamble that is very easy to lose. Credit has rendered even the upper-income middle class family debt-serfs, while credit has greatly increased the opportunities for the wealthy to buy rentier income streams. Credit used to purchase unproductive consumption creates debt-serfdom; credit used to buy rentier assets adds to wealth and income. Unfortunately the average household does not have access to the credit required to buy productive assets; only the wealthy possess that perquisite. And so the rich get richer and everyone else gets poorer. Thank you, Anthony V. ($5/month), for your marvelously generous subscription to this site -- I am greatly honored by your support and readership. Thank you, Leslie N. ($25), for your splendidly generous contribution to this site -- I am greatly honored by your support and readership. Gasoline is expensive at the pump, but by one measure oil is cheap, and poised to go higher. I recently posed this question to longtime contributor Harun I.: could global hot money flow into the crude oil market, driving the price up even if demand declines? The basic idea here is that if equities, bond and housing markets soften or roll over (please see What If Stocks, Bonds and Housing All Go Down Together? May 24, 2013), global hot money will seek speculative gains elsewhere. In an era of rising geopolitical tensions (see Syria), what better place to notch a speculative gain than oil and gold? Very good question. I suggest we not make the error of just considering nominal price. 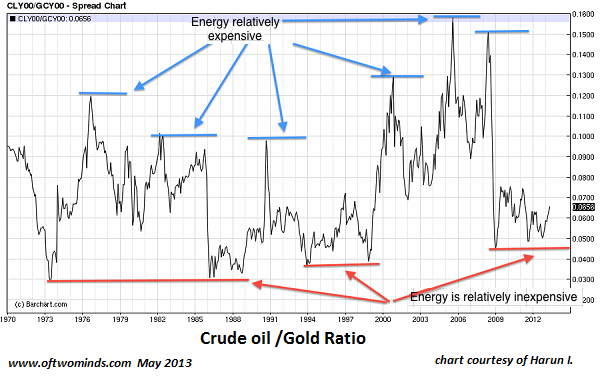 For example, below is a chart I marked up about a week ago, the Crude Oil/Gold ratio. I like relative-strength charts because they are a better indication of high and low prices and they tend to oscillate within a range. Here we see a history going back to the 1970s. At the highs and lows consider what this meant to the economy at that time. What I find rather interesting is that, currently the chart is indicating crude oil is relatively inexpensive. However, one trip to the pump says something entirely different. In fact, prices at the pump are not far off their peak from when this ratio was at its height. Now imagine what would happen to prices if this ratio returns to its high. Remember this is relative, there could be a demand collapse and this ratio could still go to its historic high. What would that look like in the economy? Well much like the Great Depression, plenty of stuff but no money to buy it. Commodities are real and the effects of hot money are felt almost immediately causing demand to collapse quickly because the real people that make up the economy don't eat paper. If hot money flows into crude oil driving pump prices to $8.00/gallon it would devastate the economy even further. The Fed is trapped. There were no good answers in 2000, 2008, or now. But the room has gotten a lot smaller. The reflationary bubble in equities has acted as a hedge but it has not increased purchasing power. No wealth has been created for the middle class. 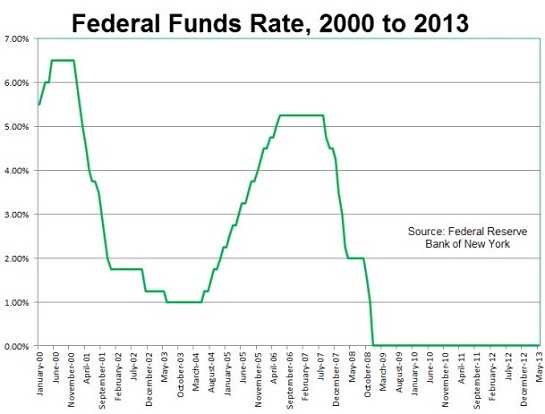 This is why the Fed cannot lift off the accelerator. Therein lies the problem. How does the Fed square the divergence of the equity markets and its monetary stance? How can it continue to claim that they are not the cause of inflation or bubbles? Where will money flow? It may foment mini-bubbles in all things tangible, classic cars, precious metals, art, etc., as the wealthy scramble to get out of cash. But there will be no place to hide. This will get messy, but the revealing of really big lies always is. The chart above is cause for grave concern. The fact that it is indicating that energy prices are cheap and have no place to go but up is sounding an alarm. It is my opinion that the average person is in no place (in terms of purchasing power) to absorb a return to the relative highs on this chart. Thank you, Harun, for the chart and the commentary. You see what happens when oil becomes expensive: the economy sinks into recession. The conventional wisdom is that oil should decline in nominal price as global demand weakens along with the global economy. In the hot-money-seeks-a-new-home scenario outlined above, demand could decline on the margins but speculative inflows--demand for oil contracts by speculators--push prices higher, potentially a lot higher in a geopolitical crisis. The central banks that are creating all the "free money" that is available to large speculators fulminate against oil speculators, as if all the free money is only supposed to go to "approved" speculations in equities and bonds. Unfortunately for the central bankers, they only create the money, they don't control what the financiers who get the free money do with it. Despite the endless MSM hype about U.S. energy independence and U.S. exporting energy abroad, the U.S. still imports over 3 billion barrels of crude oil every year: U.S. Imports of Crude Oil (U.S. Energy Information Administration). Demand for imported crude oil fell 4.9% from 2011 to 2012, tracking lower gasoline consumption and miles driven. But that's still a figurative drop in the bucket of oil imports. Anyone who believes the U.S. is impervious to geopolitical oil shocks is on a Fantasyland ride with an abrupt stop in terribly inconvenient reality. Thank you, Jane T. ($10/month), for your stupendously generous subscription to this site -- I am greatly honored by your support and readership. Thank you, George K. ($50), for your gigantically generous contribution to this site -- I am greatly honored by your support and readership. A guest essay by Zeus Y. on transforming our economy from corrupted capitalism to democratic capitalism. 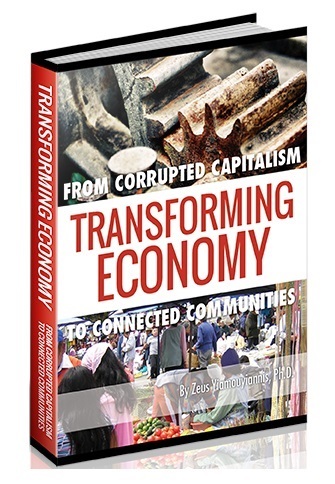 I am honored to publish an essay by longtime contributor Zeus Yiamouyiannis that is drawn from his new book Transforming Economy: From Corrupted Capitalism to Connected Communities. Readers have long looked to Zeus for help in demystifying the complex financial frauds at the diseased heart of American crony capitalism--what I call the neofeudal cartel-state financialization model. This essay is a call to citizens to put real work, ingenuity, and community above false promises and disgraced authority. Empowerment, in this essay, is not about pumping up self-esteem but rather equipping citizens to take control of the global economy. When political and economic leaders fail to act effectively, we will have to be the ones to succeed. Capitalism stands and falls upon care, not the superficial “I-feel-your-pain” type, but the deep, committed “I-give-a-damn” type. What does it mean to give a damn? We’ve gotten a lot of I-feel-your-pain care lately, the mindless talk and cloying platitudes, the excuse-making b.s. It’s high time for I Give A Damn (IGAD) care to have its day. I Give A Damn is the thoughtful, courageous, active care at the core of democratic capitalism, and we are going to need every bit of IGAD if we are going to rescue capitalism from predatory collapse. Without I Give A Damn care, functioning capitalism does not and cannot exist. The stalwarts of capitalism--value, productivity, quality, customer service, transparency, accountability, entrepreneurship, attention to detail, successful management, enforcement of law--all require that you give a damn. IGAD doesn’t require you to be liberal or conservative. In fact, it might help if you are neither. IGAD stands in sharp contrast to both unsustainable welfare state promises and corporate feudal monopolies currently masquerading as working in the people’s interest. Democratic capitalism is about worthwhile production and exchange by communities of people who give a damn. 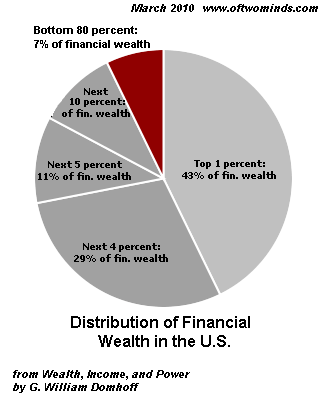 It is expressly not about either crony-driven concentration of wealth or government redistribution. IGAD doesn’t accept fake “compassionate (neo-) conservatism” or fake “get-tough” liberalism. In fact, IGAD would prefer that both of these big-mouthed do-nothing ideologies and their champions shut up and get the bleep out of the way. Since members of the status quo are clearly not going to step aside, it will be up to a fast-growing body of social, economic, cultural, political, educational, and spiritual independents to lead the charge through the status quo camp and beyond. Some people say that capitalism is built on greed or its euphemistic cousin “enlightened self-interest.” It is not. Greed could be completely eliminated and democratic capitalism would be all the better for it. Capitalism in the absence of I Give A Damn, on the other hand, would collapse immediately. Yes, Virginia, successful, healthy global economies are based on producing and giving something of value not on simply taking something of value. You wouldn’t know this from the current climate of credit-crazed consumption and crony-driven market manipulation. Right now functioning capitalism is about as scarce as the real spirit of Christmas. This is what greed (and greed’s crony, power) have brought us: a rising tide of debt and servitude built on exploitation and manipulation, quite the opposite of a rising tide of prosperity built on free enterprise promised by the so-called American Dream. “But isn’t greed human nature?” Greed is no more human nature than suicide is human nature. Right now, imbibing greed is suicide just as surely as drinking spiked kool-aid. I Give A Damn care, by contrast, is essential to any human nature that concerns itself with thriving and surviving in our new interdependent reality. Supply is not the issue. There are plenty of people capable of giving a damn. Any time natural disasters strike, I Give A Damn citizens pour out of the woodwork. Though currently submerged, I Give A Damn productivity needs to emerge and start winning the day. That requires choosing between the parts of our human nature—the desire to give and the desire to take—and then deciding and following through resolutely on the giving part. This means elevating our character, conviction, and good sense instead of cannibalizing each other. Are we going to give a damn and contribute to new life or are we going to try to take down the world as we escape into death? Are we going to stand up, man up, and woman up, or leave our children and our planet with an irretrievable mess? Without this decision foremost, all the technical talk and analysis about the economy is ultimately junk, the same junk composing junk bonds. Since so much of the current global and national decision-making is being done by an exceedingly small band of incompetents and gluttons, we need not work to divide them. They are trying to divide us. We need to unite. You give a damn, really? What have you been doing civically? Giving to Greenpeace or volunteering at the soup kitchen or attending Daughters of the American Revolution? Well, that’s good start and we need it, but all the food pantries in the world won’t make up for bad policies that eliminate food for hungry people! Capitalist cronies will gladly take the surplus created by charity cost offloading to fund their military boondoggles and leave the middle and working classes both struggling on less and caring for the needy more. For any challenge to work, citizens need to get “systemic” and become smartly organized. The time has never been riper to collaborate across the supposed dividing lines of ideologies. Haven’t you been paying attention lately? Even Ronald Reagan’s fiscal policy appointees Bruce “Supply-Side” Bartlett and David “Trickle Down” Stockman are sounding a regretful, almost progressive, tone. They now admit that their wealth-coddling ideology weakened conservatism and gave strength to party extremists. Economic productivity and participation have plenty in common with traditional conservative values (self-reliance, fiscal responsibility, etc.) and traditional liberal values (concern for “least among us,” etc.) not to mention activist, tech-savvy progressivism interested in creating sustainable ways to thrive. The ad banner for unity should merely read: “Calling all sane, caring, inventive, substantive, hard-working people.” Qualifications: 1) Have your head upright, and not crammed into some orifice (yes, you Republicans who are not part of the bigoted nutjob segment of your party), 2) have some guts, (yes, you Democrats who remember what courage is and still utilize it), and 3) have an original, interdependent, creative, collaborative character. Unity going forward does not require the promise of hope and change. Hope and change will be realized if we get down to business. I don’t have to make demands as a citizen. I’m a leader. I get busy, I organize, I pressure, I create alternatives, and I keep working, working, and working until financial, political, and cultural exploiters fold. There are no appeals to be made to a financial caste system that has proven it will not listen or change. Instead there is citizen conviction. There are reality-based principles and actions driven by the knowledge that the world can be a better place tomorrow if we use our minds, hearts, and efforts today. Nor are we going to watch you steal from us and then give us a cut of our own loot if we play ball. We are not going to agree to you borrowing from the future and piling debt on our kids. Productive citizens don’t have to make demands to financial freeloaders. We are the ones producing the value. We refuse to recognize your alleged authority. You have failed. We will develop and conduct our own leadership, value, and exchange. You, the idle rich, the financial delete, are expendable. You offer nothing, unless you are willing to roll up your sleeves and do some real work. So stop doing ‘God’s work’ by stripping commissions from production, and start producing something of value. Be a stakeholder. Participate in the market. Be accountable to the market. Be a democratic capitalist, for God’s sake. That is our one and only requirement. • Having money never makes you better than someone else. What is relevant is how you get your money. Any tool or crook can possess large sums of money. • Real personal worth involves human character and choices. It is not a financial dollar figure. Without a sober assessment of human character and choices there is no way to make a distinction between producers and parasites, no social distinction between those who invest in constructive vs. destructive enterprises. These distinctions are crucial in functioning capitalism. • Maximizing personal profit at any cost destroys capitalism and capitalist societies. Additional financial profit can always be made by plundering natural resources and abusing people. That is not the kind of profit we can tolerate in democratic capitalism, even if it is available. 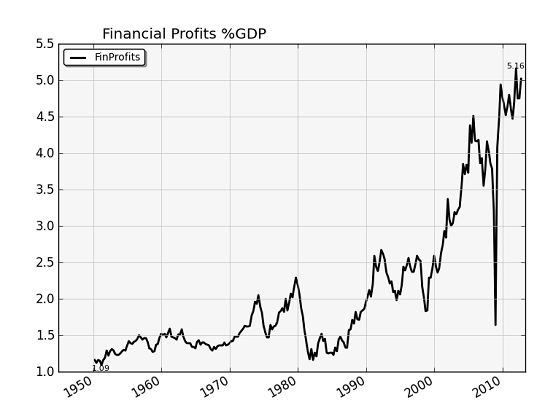 • “Making money off the crisis” will drive capitalism into a sinkhole if it is dominated by profiteering from the misery of others, rather than from countering irrational exuberance. • People who financially benefit from sucking, deceiving, lying, cheating, and stealing, should be thrown either into jail (fraudsters) or to the side of the road (talking heads, industry flacks, technocrats, etc.). If you make money by destroying people and their societies you are a corrupt capitalist, a looter, a thief, and and/or a murderer, period. If you are a government official who rewards these destruction-bringers, then both you and the private interests you prostitute yourself to must be defeated with democratic voting and citizen action. Revolutions start when growing groups of people congregate in cafes, taverns, meeting halls, and homes. For productive democratic capitalism to work, we need to get together and start doing the things that help our ability to survive and thrive, individually and collectively, and stop doing the things that harm. • Get your money out of too-big-too-fail banks, all of it. Move savings, money markets, retirement accounts. Divest everything and both “strongly encourage” and help every family member, neighbor, and investor to do the same. If Bank of America can’t respect the laws and principles of capitalism, then maybe they will respect the laws of accounts: When you have no money, you can’t spend squat and you can’t make a profit. Welcome to what the rest of America is experiencing. • Rebel against the consumerist “American Dream” that is making your life a nightmare. If there is one thing you should refuse to buy it’s the media mantra that the solution to everything is to just get consumer spending up, up, up. It’s a pyramid scheme run against a finite planet. This is a recipe for destroying, not aiding, future generations. And spend with what? Your great job that has not returned (or even materialized). Your growing debt? Make reality your ally. Stop buying from irresponsible corporations, buy second-hand goods from friends and neighbors, and support community business with the money you save. • Say “no” to debt servitude! If you cannot pay your debt, seek legal, political, and personal solutions. Community-organize to provide low or no cost legal bankruptcy protection. Work politically to get student loans to be dischargeable debt. Research and get competent legal advice on how to renounce or negotiate down debts to large companies you cannot reasonably pay. “Moral sanctity of the contract” is demonstrated by accepting the legal and financial consequences of failure. The lendee loses equity and receives a bad credit rating for payment failure. The lender receives financial loss for asset failure. • Say “yes” to strengthening, simplifying, and de-expensing your life. Take care of yourself physically, mentally, emotionally, and spiritually. Don’t eat garbage food. Exercise regularly. Take non-essential activities and luxuries (i.e. cable TV) off your plate. Attend a free book lecture. Donate or sell the things you are not using. Meditate. Contemplate. Vitalize. Organize. You are going to need every aspect of your health in peak condition to best meet and embrace the seismic world changes that will be coming much sooner than we all think. • Pool your money, resources, and time. Even with their big infusions of taxpayer bailout money, banks aren’t lending to Main Street. Do we really need them? Why not gather momentum around crowd-funding and circle lending at all levels. Why can’t young people or young families move in together and share and trade their resources around childcare, meal preparation, elder care, professional skills and so forth. This mini “economies of scale” could free up significant space to develop an entrepreneurial business or spend more time organizing and developing the infrastructure for sustainable and fulfilling social and economic advancement. Corruption thrives when good people do nothing. Societies rebound when good people do something. Let’s do this. Let’s make democratic capitalism happen. This essay is from the newly released book, Transforming Economy: From Corrupted Capitalism to Connected Communities by Zeus Yiamouyiannis, Copyright 2013. Thank you, Darren B. ($250), for your outrageously generous contribution to this site -- I am greatly honored by your steadfast support and readership. Thank you, Helen S.C. ($10), for yet another wondrously generous contribution to this site -- I am greatly honored by your steadfast support and readership. Irony alert: yes, I am posting a list to critique articles that hook readers with lists:you know what I mean, the endless stories based on lists: 7 dumb things we do with smart phones (#1: turn them on, #2: continue texting while we distractedly drive off a cliff), 6 best gifts for pets, 9 greatest celebrity comebacks, 10 foods to avoid, 10 foods that reduce cancer, 5 chilling revelations about Benghazi, 15 hottest housing markets, and so on. 1. Lists are crack cocaine for curiosity. We already know the 10 foods to avoid, and that nine of them are our favorites, but we can't resist seeing if there is some outlier in the list we didn't know about. 3. Lists compel us to read them in order to substantiate our mastery. Very few things are more satisfying than "ha, I knew that." 4. Lists activate our need to find our place in the hierarchy. Are we in one of the hottest housing markets, or not even on the list? We want to know our status in the pecking order, even if it entirely arbitrary and meaningless. 5. Lists encourage mind-candy addictive behavior, i.e. jumping from one bite-sized list of low-value, repetitive content to another. As if the culture isn't already attention-deficit disabled enough. 6. Lists challenge us to guess which filter was used to derive the list. What was left off the list, and why? Was it overlooked, edited out because it was taboo (or not taboo enough)? The editorial process of fabricating the list is generally unexplained, but we can't ascertain how clumsy or misguided the list might be until we read it. But by then, the list has accomplished its purpose, i.e. logged a page view. 7. I only have six reasons, but 7 sounds better than 6. My friend and mentor Jim Kunstler was kind enough to invite me to his podcast program: KunstlerCast #330: A Conversation with Charles Hugh Smith. I mention my "Hollywood ending" for 2013: a stock market collapse that utterly discredits the Federal Reserve's policies and all those who supported them. We also discuss the insane costs of sickcare. Thank you, Toby B. ($50 in misc. interesting currencies), for your awesomely generous contribution to this site -- I am greatly honored by your steadfast support and readership. Thank you, Karl L. ($50), for yet another wondrously generous contribution to this site -- I am greatly honored by your steadfast support and readership. 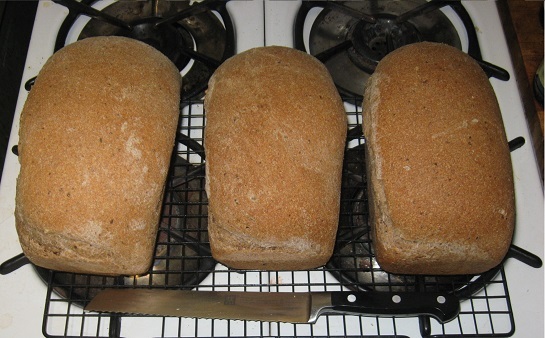 From the oven: home-made whole wheat bread. Bread, "the staff of life" in much of the world, isn't for everyone. Many people find their well-being improves after removing gluten from their diet. Some see the dramatic rise of obesity in the 1980s as causally related to the widespread adoption of specific types of wheat. We include a few tablespoons of ground flax seed in the dough for a nutty flavor and the extra nutrient boost of omega-3 fatty acids and phytochemicals called lignans. 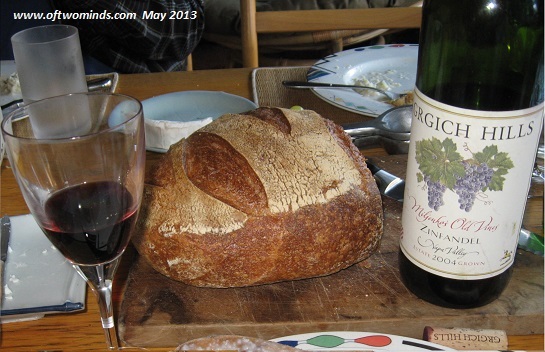 The excellent bread knife shown here was a gift from longtime correspondent Kevin K.
Although it's often lost in a culture that glorifies extremes, "moderation in all things" is key to healthy living and enjoyment. I know it sounds weird to the depoliticized mainstream, but "A healthy homecooked family meal and a home garden are revolutionary acts." Thank you, Royce M. ($75), for your supremely generous contribution to this site -- I am greatly honored by your steadfast support and readership. Thank you, Frank S. ($150), for your outrageously generous contribution to this site -- I am greatly honored by your steadfast support and readership. What If Stocks, Bonds and Housing All Go Down Together? About the claim that central banks will never let asset bubbles pop ever again--their track record of permanently inflating asset bubbles leaves much to be desired. 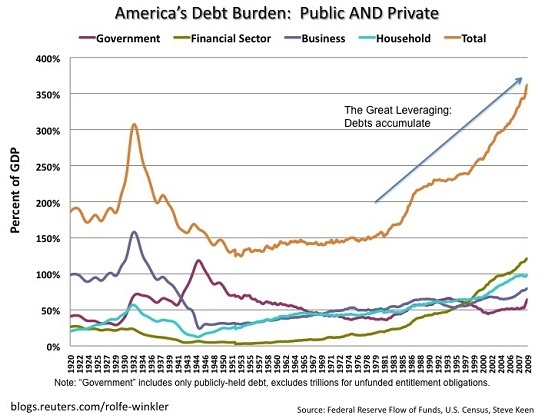 The problem with trying to solve all our structural problems by injecting "free money" liquidity into financial Elites is that all the money sloshing around seeks a high-yield home, and in doing so it inflates bubbles that inevitably pop with devastating consequences. As noted yesterday, the Grand Narrative of the U.S. economy is a global empire that has substituted financialization for sustainable economic expansion. In shorthand, those people with access to near-zero-cost central bank-issued credit can take advantage of the many asset bubbles financialization inflates. Those people who do not have capital or access to credit become poorer. That is the harsh reality of neofeudal, neocolonial financialization. Neofeudalism and the Neocolonial-Financialization Model (May 24, 2012). Injecting liquidity by creating credit and central bank cash out of thin air is not a helicopter drop of money into the economy--it is a flood of money delivered to the banks and financial elites. The elites at the top of the neofeudal financialization machine already have immense wealth, and so they have no purpose for all the credit gifted to them by the central banks except to speculate with it, chasing yields, carry trades and nascent bubbles (get in early and dump near the top). Life is good for the kleptocratic financial Aristocracy: for debt-serfs, not so good. No wonder the art market and super-luxury auto sales have both exploded higher. Thanks to the central banks' liquidity largesse, the supremely wealthy literally have so much money and credit they don't know what to do with it all. If you want to borrow money to attend college, the government-controlled interest rate is 9%. If you want to speculate in the yen carry trade or buy 10,000 houses, the rate is near-zero or at worst, the rate of inflation (around 2% to 3%). If you want to borrow money for anything other than a socialized mortgage to buy a single-family home, tough luck, you don't qualify. But if you want to speculate with $10 billion--here's the cash, please please please take it off our soft central-banker hands. 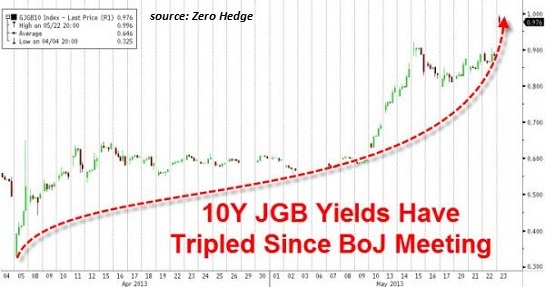 If your speculations end badly, then no problem, we transfer the toxic trash heap of debt and phantom assets onto the balance sheet of the central bank or onto the public (government) ledger. It is widely accepted as self-evident that all these bubbles will not pop because the central banks won't let them pop. That's nice, but if this were the case, then why did stocks crater in 2000-2001 and 2008-2009, and why did the housing bubble implode in 2008-2011? Did they change their minds for some reason? No; they assured us right up to the moment of implosion that everything was fine, there was no bubble, etc. The only logical conclusion is that bubbles pop even though central banks resist the popping with all their might. In the past, central banks were pleased to inflate one bubble at a time, enabling money both smart and dumb to flee one smoking ruin and get busy inflating the next bubble-ready asset class. But now, thanks to essentially unlimited liquidity and credit, the central banks have inflated three bubbles at the same time: stocks, bonds and housing. That raises an interesting question: what if all these bubbles pop in unison? Will the central banks be able to place a bid under all three markets simultaneously? If so, where will all that freed-up cash go next? One possibility is gold, another is commodities such as grain and oil. The latter is especially interesting, because central banks and governments hate energy speculators with special intensity because the "Brent vigilantes" have the power to boost inflation where it matters, i.e. energy. Once energy takes off in a speculative bubble, the rising cost of energy sucker-punches the already-anemic global recovery, and the responsibility eventually lands on the laps of the central banks who created all the bubbles. Their quantitative easing policies discredited, the central banks will have to restrain their liquidity hand-outs, and that will undermine what's left of the various speculative bubbles they've blown. 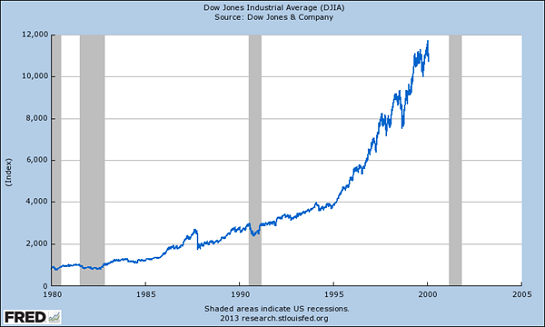 Those who argue bubbles won't be allowed to pop ever again should look at history from 1999 to the present again. Thank you, Arooj S. ($10/month), for your outrageously generous subscription to this site -- I am greatly honored by your support and readership. Thank you, Kendall H. ($5/month), for your superbly generous subscription to this site -- I am greatly honored by your support and readership. A data-based look at the financial context of the past 30 years from the perspective of Gen X.
I am honored to publish an insightful essay by longtime contributor Eric A. on the inconvenient financial era Generation X finds itself in. What sets this essay apart from most other generational analyses is its focus on data and charts. In The Brewing Generational Conflict (May 15, 2013), I mentioned the Cultural Monster Id (CMI) that arises whenever inter-generational emotions are freely expressed. Every generation-- the Baby Boomers, Gen X and Gen Y/Millennials--is slammed for its supposed character flaws. Personally, I don't find much value in these outpourings of Cultural Monster Id, for several reasons. 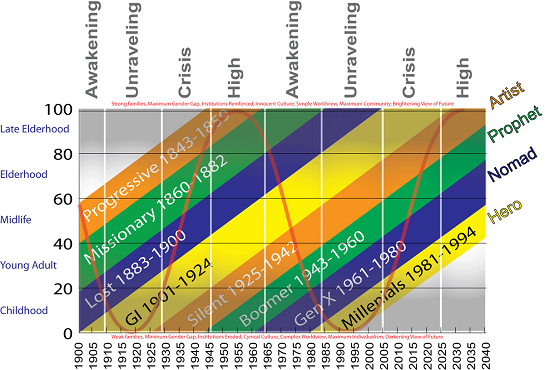 One is that generations do not naturally divide into crisp cohorts; people are shaped by the events and shifting myths/worldviews of their culture. As a result there is an inescapable arbitrariness to bright lines between generations. There's also a bit of intrinsic falsity in defining generational characteristics. Were the draftees of the Vietnam Era any less heroic than the draftees of World War II? Were the volunteers of World War II and Vietnam any more heroic than the volunteers of Desert Storm? We can while away many a night around the campfire lambasting or lauding various supposedly generational traits, but I don't think that gets us anywhere useful. Ultimately, there is an element of luck in history, and it doesn't neatly favor generations evenly. For example, the Silent Generation (born 1925-42) got stuck with a thankless war in Korea (1950-53), but was handed a golden opportunity to buy housing in the late 1960s before Boomer demand and geographical constraints sent it skyrocketing. Homes in high-demand areas purchased in the late 60s (before most Boomers could afford to buy a house) doubled in value in a few years and went on to rise 10 or even 15-fold in the ensuing 35 years. Luck matters, timing matters, but so does context. There are four Grand Narratives at work: demographics, resource extraction/pillaging, geopolitical conflict and the nature of the economy. The last two are heavily influenced by the first two; some studies suggest that large cohorts of unmarried, under-employed males are precursors to war, as political leaders channel that restless and potentially disruptive force against external enemies. The Grand Narrative of the U.S. economy is a global empire that has substituted financialization for authentic, sustainable economic expansion. In shorthand, those people with capital and access to credit can take advantage of the many asset bubbles financialization inflates. They have a chance to do very well for themselves, if they have the presence of mind to exit the asset bubble before it deflates. Large cohorts generate their own self-referential feedback loops. A large cohort of home buyers drives up real estate as demand exceeds supply, and those who get in early are handsomely rewarded. Those seeking similar returns provide the fuel for further advances. This is the basic story of housing from 1970 to 2006 and the stock market from 1981-2013, as the Baby Boom cohort bought houses and saved for retirement via stock and bond mutual funds. As the Boomer cohort sells its homes and stocks, supply will exceed demand and prices will decline, especially if household capital and access to credit are also declining. This selling cycle will also be self-reinforcing. 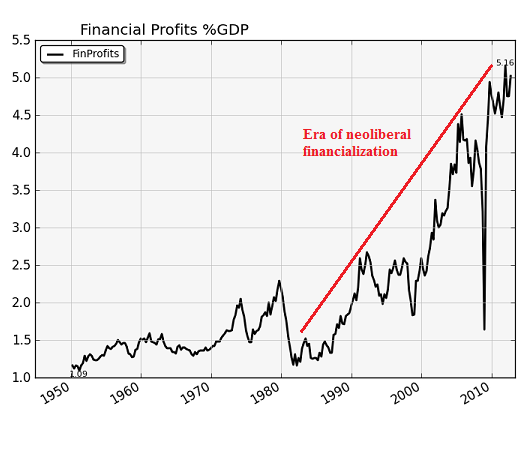 In my view, the reality Eric describes is part of the larger destructive narrative of financialization. Those people who are prepared for the inevitable collapse of the financialization era of debt, centralized manipulation and fantasy will do well for themselves and their families. My position on the entitlements promised to the Baby Boomers has been clear since 2005 (Boomers, Prepare to Fall on Your Swords June 2005): demographics, the changing job market and the destructive consequence of financializing the U.S. economy render the entitlements promised (Social Security and Medicare) unpayable. Lately there has been some talk about Generation X and retirement. “The typical Gen X couple, born between 1966 and 1975, only has enough savings to replace half of its pre-retirement earnings. Married Americans born during the first part of the baby boom, from 1946 to 1955, can expect to retire with about 82 percent of their income.” (Gen X Has New Reason to Resent Boomers as Retirement Looks Bleak). 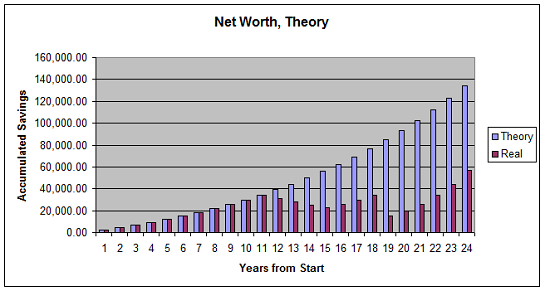 The response from some circles has been that the net worth of GenX is half that of their parents because they’re slackers who blew the money. Really? Setting aside how the Boomers have been the most spendthrift generation in American history, quadrupling personal household debt and doubling US Federal debt in a single lifetime, I’d like to focus on something much simpler: 6th grade math. 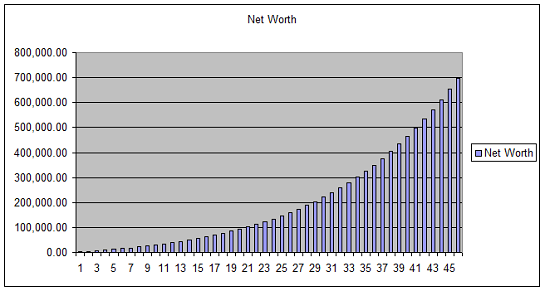 This is your standard net worth chart, starting with an income of $20,000 at age 20 and increasing income by 3% a year to a pleasant $40,000/year at age 43. 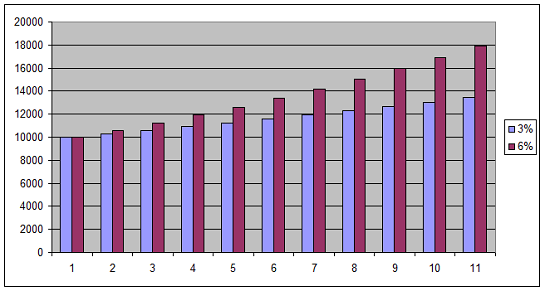 This person saved a standard 10% of their income, and invested at the standard 6%/year compounded. So what does this have to do with GenX? Note it takes 21 years to reach the first $100k, but only 8 to reach the $200k and 4 to reach $300k. This compounding-made-real actually happened from 1980-2000. Note anything on this chart? The Boomer generation had a rough start in the bear market of the 70’s, but were only about 25 when it ended, so the Bull run coinciding with 20 of their core income years. Very nice. Why should that matter? 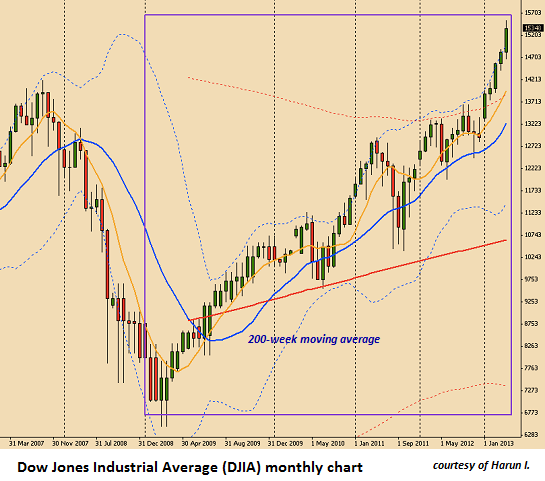 The Dow has now recovered and gone to new highs of 14,000. Wow! 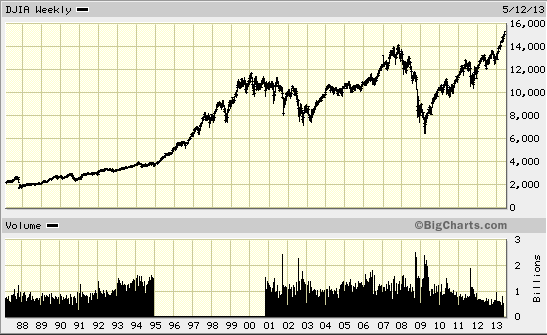 Right at the 10-year compounding point in 2000, the X-er’s market clock was re-set to zero. 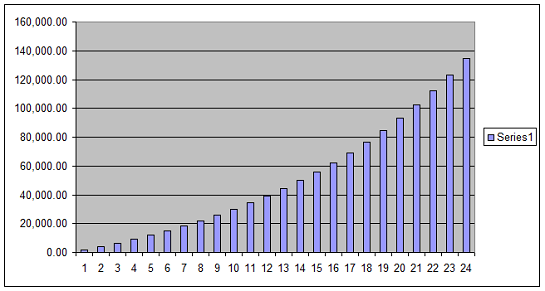 Then in 2008, the next 10-year compounding point, they were re-set to zero again! Remember what we said about compounding being strongly back-loaded? The difference in 6% compounding vs the market stalling at the critical 10 year mark has cut GenX net worth in half! 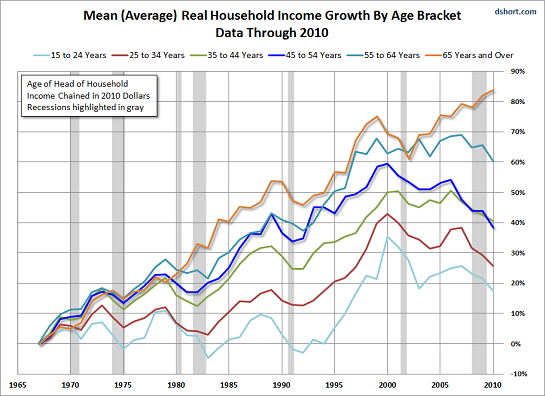 And if this chart was inflation-adjusted their net worth would be another 30-50% lower! What did the Bloomberg article say again, that GenX has half the retirement savings of their parents? That reality is exactly what we predicted given the math. Anybody want to argue about how Boomers worked hard to succeed but GenX and Y are slacking wastrels? Or does math trump all? But okay, maybe despite advertising to the contrary GenX should have known better than to trust a 19 year-old bull market. Maybe they should have gone short. If so, when? Going short in 2001, they would have to have reversed and gone long in ’03, then short in ‘08, then long in ’09, and possibly short again sometime soon? Is asking a whole generation to pick 5 exact tops and bottoms reasonable? Perhaps not. If not, where should they have put their money? 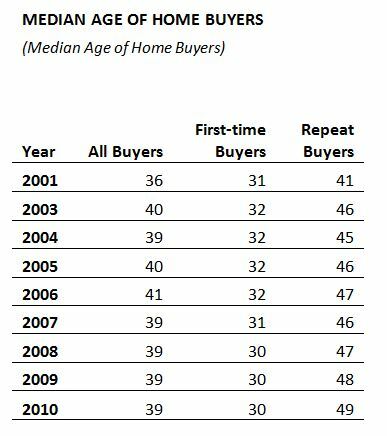 Severely burned by stocks, GenX statistically became first-time homebuyers at the age of 32, not much older than when their parents did. 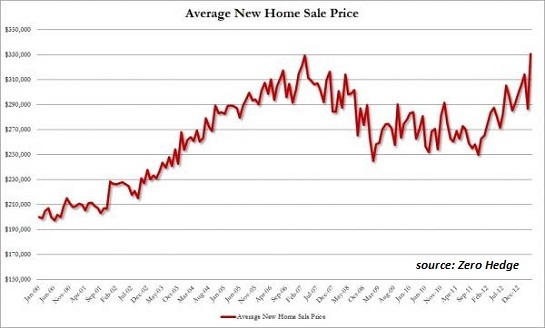 However, they bought their first home in 2005, not 1985. How did that work out? Whoops! 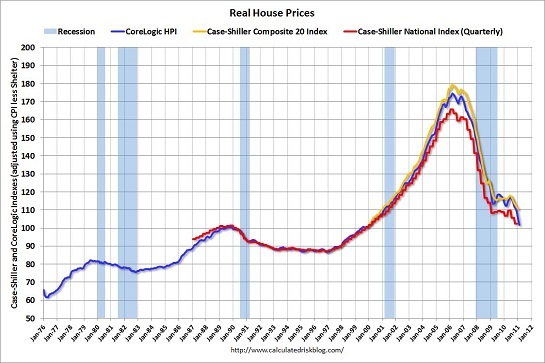 Sorry, suckers, stole your money again: your peak home-buying years coincided with another bubble! Housing was no safe-haven. Not only that, but again, the catastrophe is not the up-front losses but the 10 years of lost compounding that can never be re-made. The math says that if GenX worked until they were 80, they will NEVER recover. But there is only one national economy, all the same houses, same stocks, same companies: to some extent it’s not a matter of national wealth, but the DISTRIBUTION of wealth in the nation. So if GenX was systematically disenfranchised by engineered stock and housing bubbles plus low interest rates, who was their expected slice of GDP transferred to? That’s right, the Boomers, in allegiance with the financial elite, engineered a transfer of all other generations’ income to themselves. This, plus being born in an expanding demographic, was the totality of their investing genius. Why should anyone protest this observation? 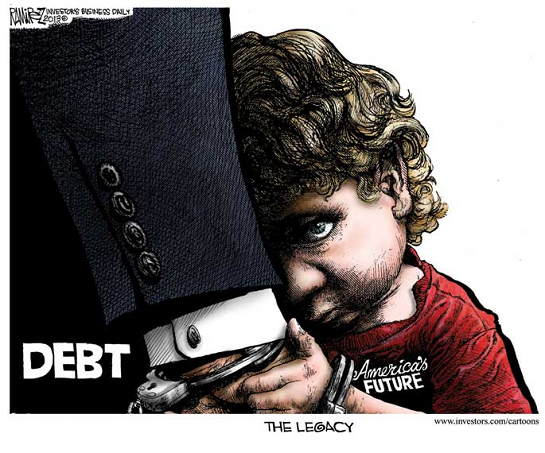 What do you think the decades-old phrase “the national debt has enslaved our children” means? It means that the Boomers, who were in power at that time, took all the wealth of the nation for themselves and left their children with the bill. That’s not a surprise, it’s well-known fact that has been approved of by everyone in power for 20 years. I’ve been hearing it openly stated since before the National Commission on Social Security in 1983. When I was 13, my national parents said that I would pay their debts so they could get wealthy at my expense, and they have fully kept their promise. Now I am 43 and not only had the $80,000 of my net worth systematically stolen, but being unable to outvote them, have been saddled against my will with the $50,000/person of the national debt. An estimate of $130,000 per person has been transferred. From us, GenX and Y, to them. And with 10,000 Boomers a day retiring and a 1:1 worker to recipient ratio, they expect much, much more. So think again before you so easily dismiss the 25% unemployment rate and 3rd-world incomes of Generations X and Y and start with a short lesson on the problems of exponential functions. Yet this terrible math leaves the question of what's next? Can this unequal state of affairs remain a permanent feature of American life? Can the work of one group-- the very hours of their life--be morally claimed and transferred to another by dictate? That is to say, does one generation have the right to enslave another, whether physically with chains they never earned, or financially with debts they never accrued? And if this transfer was voted into power by a generation and enforced by government dictate, why can’t Generation X and Y vote to transfer all the Boomers’ wealth back to themselves? 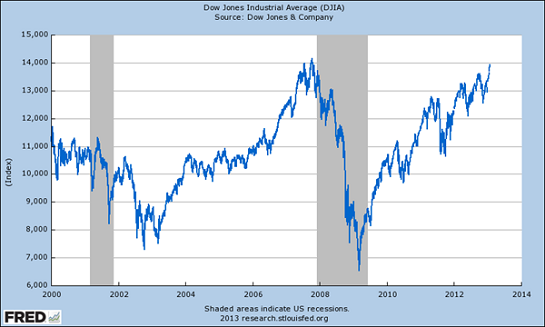 We don’t know at this time, but with the Dow at all-time highs it would seem that, one way or another, incomes and prices can only revert to the mean. And brother, speaking from the bottom, it’s a long way down to here. On a related topic: AND THE BAND PLAYED ON Jim Quinn on the Millennial Generation and the Fourth Turning. Thank you, Riley T. ($120), for your outrageously generous contribution to this site -- I am greatly honored by your steadfast support and readership. Thank you, Matt S. ($5/month), for your most excellently generous subscription to this site -- I am greatly honored by your support and readership.